Inspired by nature, and one of its most beautiful elements, gold, Nokia today unveiled the Nokia 8800 Sirocco Gold – a bold and prestigious new style statement. Encased in a luxurious 18-carat gold plating, the precisely crafted Nokia 8800 Sirocco Gold combines timeless design with a contemporary flair, resulting in an exclusive display of personal style and elegance. The Nokia 8800 Sirocco Gold is now available in select markets, with an estimated retail price of EUR 1000, before taxes or subsidies. Heikki Norta, Senior Vice President, Mobile Phones, Nokia. 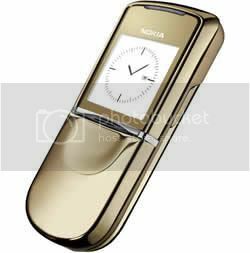 The Nokia 8800 Sirocco Gold remains true to the “form follows function” mantra of Nokia designers and engineers – a tradition built upon decades of experience in mobility. Created with a dedication to perfection, the crafting of each Nokia 8800 Sirocco Gold draws from techniques mastered over hundreds of years by watchmakers and jewelers. A smooth sliding mechanism reveals a high-resolution camera (2 Megapixel) and the intuitive and ergonomic keypad. Further “inner beauty” highlights of the Nokia 8800 Sirocco Gold include a stunning color screen (up to 262K colors), and a wide array of messaging functionalities. The elegance of the Nokia 8800 Sirocco Gold is also complemented by a coordinating desk stand and color-matching Bluetooth headset. The Sirocco wind – originating in the Sahara desert – serves as the inspiration to the design and naming of the Nokia 8800 Sirocco Gold. The harmonious blend of the strength and beauty of nature is the theme for the entire Nokia 8800 Sirocco line.